Whenever I think about Arepitas de Yuca, I automatically think of my mom jumping for joy. Here’s the thing, my mom doesn’t love Arepitas de Yuca— she LOVES Arepitas de Yuca. It’s an absolute weakness of hers. 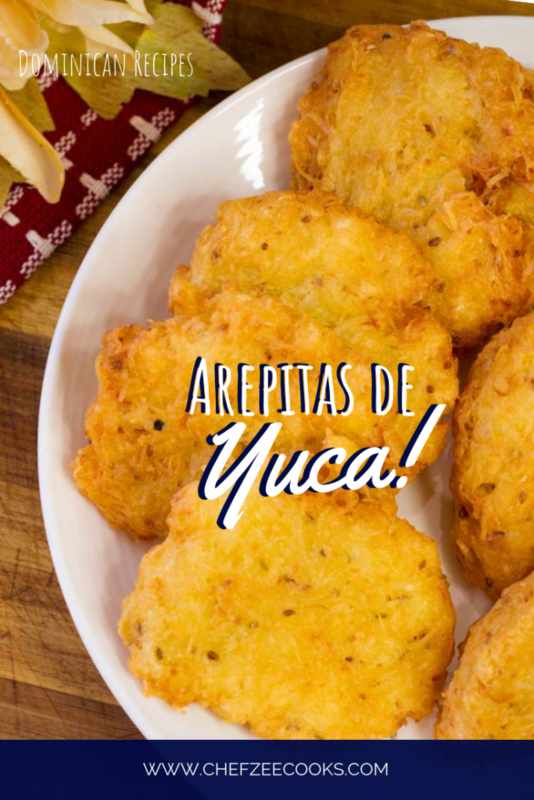 In fact, whenever I make these awesome Yuca Fritters, I have to make a separate batch for her and for guests because she will eat every single last one… and she has, many times! They’re insanely easy to make yet so flavorful. It’s an appetizer and fritura that you can make in under 30 minutes. It’s one of my personal favorites to make whenever I’m strapped for time or resources. All you need are Yuca, eggs, salt, sugar, and anise seeds. Now I know what you’re thinking, Arepas or Arepitas are supposed to made of cornmeal or flour, how does Yuca play into the equation? To be honest, this is a question that I ask myself all of the time whenever I come across certain foods. For example, one of my favorite Dominican Desserts is Arepas also known as Torta. It resembles NOTHING like the Venezuelan and Colombian favorites. It’s one of those things that leaves you wondering, how did Dominicans come to name certain dishes after classic dishes that are nothing like the original? My guess, much like the Dominican Chimichurri, (head’s up it’s a burger not a sauce **mind blown**) these dishes started off similar to the original and over time, Dominicans put their own stamp on it without ever changing the name. This is something that I see time and time again as I research and teach Dominican cuisine. It’s also one of my favorite quirks about Dominican cuisine because there’s influences from every part of the world. When making Arepitas de Yuca, know that the hardest and most arduous part is actually grating the yuca. I recommend gathering the kids, nephews, and anyone who wants to get their hands dirty that you also trust with a grater to come help you. I’ve always made the mistake of going to the gym on the same day that I make this dish. Once you’ve grated a few yucas, your arms will be burning but at least you got in a workout! With that being said, I do recommend using fresh yucas to make this dish. Save the frozen yucas for when you want to boil them and eat them with mojo, yum! If you’ve never peeled a fresh yuca, know that this root vegetables does come with its own nuances. To start, it’s TOUGH and durable. It’s amazing how ends up being so delicious when boiled or fried. Start by cutting off the ends and making a slit through the tough skin. Afterwards, the skin will peel right off like magic. I personally think peeling a yuca is easier than peeling a green plantain. My mom highly disagrees with me! Nonetheless, after you peel the yuca you want to cut it into medium size pieces and be very VERY careful. Remember, this delicious delight is TOUGH! After you’ve cut them into medium size pieces, be sure to cut those in half. You want to get to the vein that courses through the yuca. Remove the vein especially when making Arepitas de Yuca. Sometimes you can get away with leaving the vein and removing it once cooked, but it’s best to clean it up as much as possible before cooking. 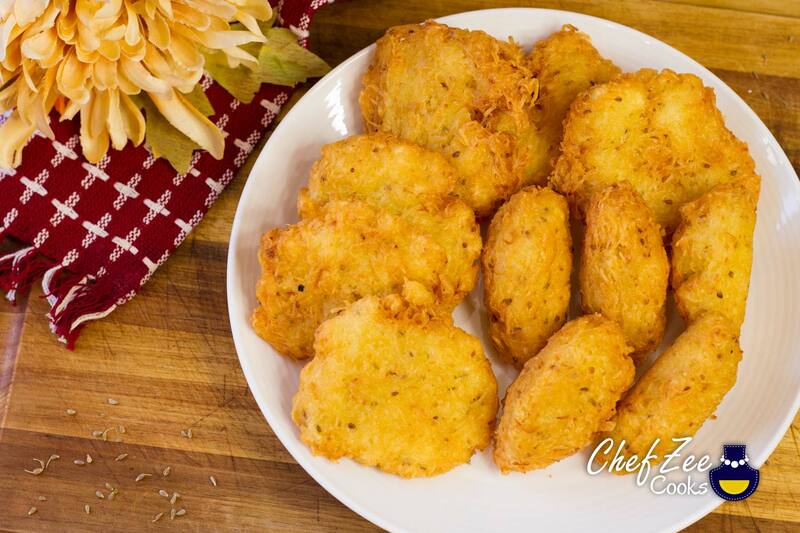 Once you’ve peeled and diced your fresh Yuca, it’s time to grate away and start making arepitas! Feel free to shape them however you like! I typically do a mix of the flat arepitas and the chulito arepitas which resemble mini cigars. My boyfriend is used to eating them flat and my mom likes the chulito style since it’s how my grandmother made it. Both are classic shapes fry beautifully! Speaking of frying, make sure to follow the same tips and tricks as I shared in: How to Fry The Perfect Tostones! Tip #1: Warm up oil over medium flame. You want the arepitas to brown evenly on the outside and also cook on the inside. If your oil is too hot, you risk burning the outside and leaving the inside raw. No bueno. Tip #3: Enjoy while hot! Just like Tostones, Arepitas de Yuca are best when they are hot, hot, hot!!! If you’d like to see a step-by-step tutorial on How to Make Arepitas de Yuca, visit my YouTube Channel: Chef Zee Cooks. Make sure to Pin this yumminess to your boards! Serve immediately and enjoy arepitas while they are warm.